Virginia is often ranked as one of the top states for retirees, according to lists published by groups like AARP or Bankrate. Temperate climate, good healthcare, and standard of living are all listed among Virginia’s advantages. During the past decade, however, few retirees moved to Virginia, and more 65- to 74-year-olds moved out of the state than in. Additionally, despite both college towns and cities being promoted as attractive retirement spots, in Virginia’s major cities more retirees moved out than in and there was no great influx of retirees moving in to college towns such as Blacksburg or Charlottesville. Instead rural and suburban regions were the only areas in Virginia to experience growth due to in-migration of retirees. Regional differences are interesting. Northern Virginia and Hampton Roads both attract large numbers of federal and military employees from across the country, yet many likely leave Virginia when they retire, offsetting the in-migrating 55- to 74-year-olds. Much of the retiree in-migrating growth in rural regions came from retirees moving out of urban areas such as Northern Virginia and Richmond, but also from retirees moving in from other states. County level migration data also shows that retirees were more likely to move out of, rather than in to urban areas during the past decade, and this was true not only in large urban areas, but also in smaller cities such as Danville or Roanoke. Counties near urban areas experienced little growth in their retiree age population from in migration. Instead, the counties with the largest growth of in-migrating retirees were rural, mostly east of the Blue Ridge, and within an hour of large urban areas. 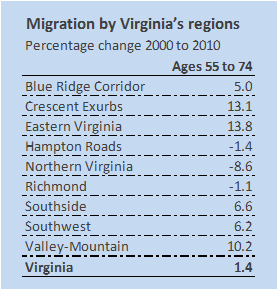 As the chart above shows, every rural region of Virginia grew from in-migration of 55- to 74-year olds, with Eastern Virginia and the rural counties in Virginia’s Exurban Crescent growing the most. When retirees chose which rural counties to move to, they largely favored counties reasonably close to cities with a major airport, hospitals, and attractions. Fewer retirees moved to remote counties in Southwest or Southside. Many of the fastest growing counties in Virginia during the past decade met this criteria, such as Goochland or New Kent, where the in-migration of 55- to 74-year-olds accounted for more than a third of the total county population growth. Climate was also a factor as the most temperate parts of Virginia near the Chesapeake Bay attracted far more retirees than the counties west of the Blue Ridge which have much longer and harder winters. The strong preference of Virginia’s retirees for rural areas runs counter to much of what has been written about where retirees want to move. College towns and cities have both been listed as attractive retirement spots, but in most major cities more retirees moved out than in, and in college towns such as Blacksburg or Charlottesville, retiree population growth was much slower than in neighboring counties. Living in a city or college town can be very attractive, but also expensive relative to rural areas, particularly for retirees with a limited budget. The high rate of retirees moving out of Virginia’s urban areas into rural areas has resulted in a large age difference between the urban and rural regions of the state. During the last decade, 82 of Virginia’s 95 counties aged faster than Virginia as a whole.The result is that, except for counties with major universities, every rural county in Virginia is now older than Virginia’s median age of 37.5, and most rural counties are considerably older. Urban areas, in contrast, aged more slowly and are largely younger than Virginia’s median age. A dozen cities and urban counties actually grew younger during the same period, in large part due to the net out-migration of retirees. Retirees moving to Virginia’s rural counties have benefited from the low cost of living and amenities in these counties, and, in return, many rural counties have benefited from retiree-driven population growth and increased tax revenues. Over time, however, it is possible that life in rural areas will grow more difficult for retirees as driving becomes harder the need other forms of transportation increases. Needs for medical center services, often concentrated in urban areas, will also increase for retirees. So, while both retirees and rural counties have benefited from recent trends, the next decades will present challenges as well to retirees and to the communities in which they live.